I was uploading photos from this weekend to Flickr when I realized that I never posted last month’s meetup. Unfortunately I only have digital photos, because the batteries in my flash were dead and I didn’t realize it until the morning of the meetup. Oh, well. 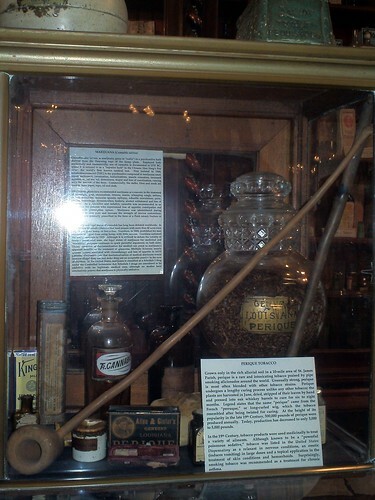 First we went to the New Orleans Pharmacy Museum on Chartres Street. 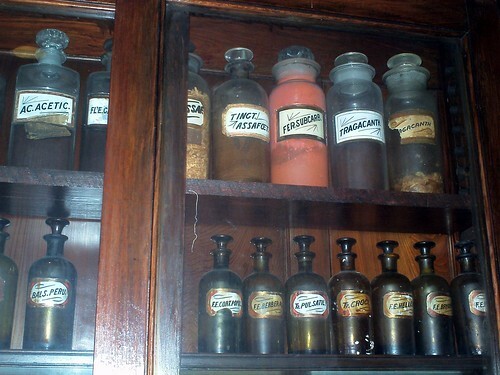 It’s a museum of 19th century medicine housed in the office/home of the first licensed pharmacist in the Louisiana Territory. All of the displays are authentic, none of the items are reproductions. If you’re in the French Quarter and looking for something a little different I recommend it. It was really interesting, there was a lot to see, and admission is just $5. 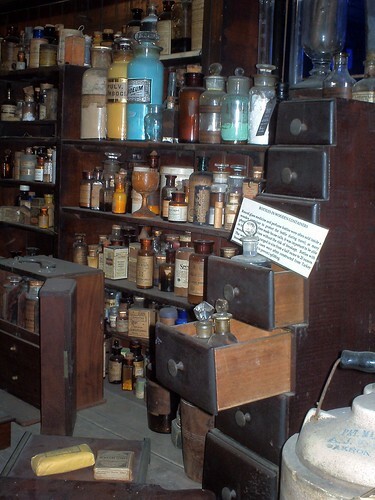 One of the things I found fascinating was how so many of the herbal medicines of the 19th century contained ingredients that are used today in rootworking–the apothecary jar 4th from the right on the top contained tincture of asafoetida, a foul-smelling herb sometimes called “devil’s dung” that is used in Hoodoo to both repel evil and harm enemies. I saw a lot of other names I recognized, too. I really, really want this graduated chest of drawers! Pharmacists sometimes compounded silver- or gold-plated pills for their wealthy clients. They knew that the metals had no medicinal properties, but they also knew they’re inert and pass through the system without causing harm, and it got bored rich people to quit whining about their made-up problems for 5 minutes, so what the hell. This was a display about the medicinal use of cannabis and perique (a type of tobacco grown in Louisiana)–tobacco was apparently prescribed to treat asthma! 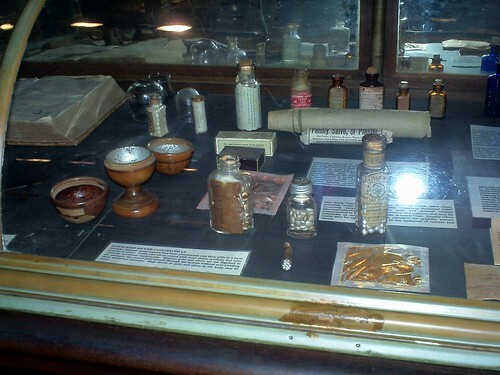 Display of Voodoo potions. 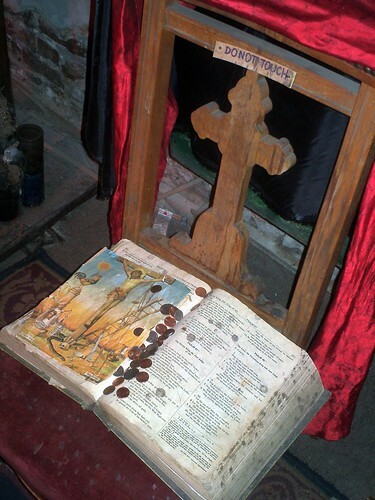 People used to get their spiritual supplies from the same place that they got their medicine. 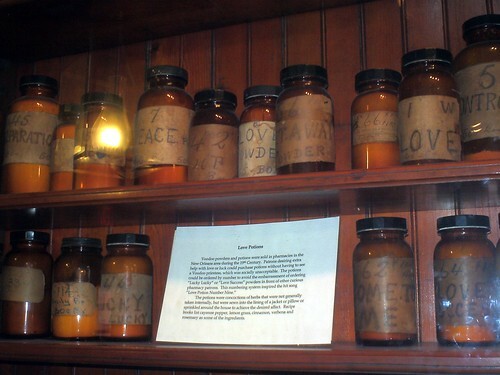 The potions were numerically coded (hence “love potion #9”) so that rich white people could ask for them without admitting they practiced or believed in Voodoo, which officially was only practiced by slaves and free people of color. 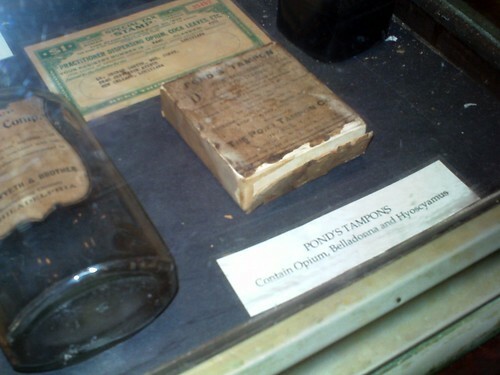 Tampons in the 19th century contained opium. I demand a return to this practice. 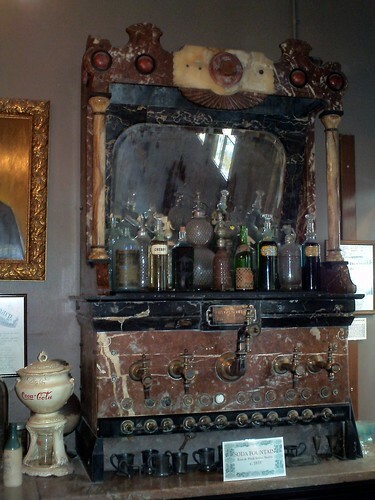 Early 19th century soda fountain. Soda was invented to get people to take bitter-tasting medicine, they would drown it in sugary flavored syrups and add mineral water. 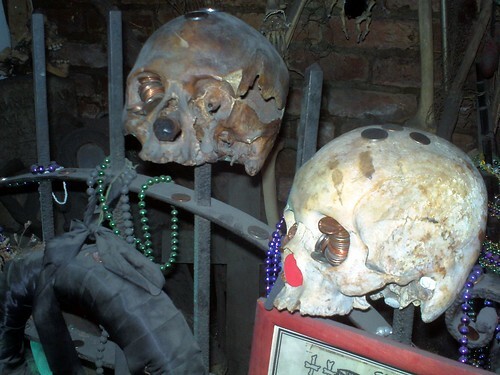 Afterward we walked to the Historic Voodoo Museum on Dumaine Street. It’s pretty small, just 2 rooms and a hallway. And their air-conditioning does NOT work very well, it was stifling. In addition, the exhibits were filthy with dust, and some of them were a little… exaggerated, shall we say. Kanzos in the bayou, etc. 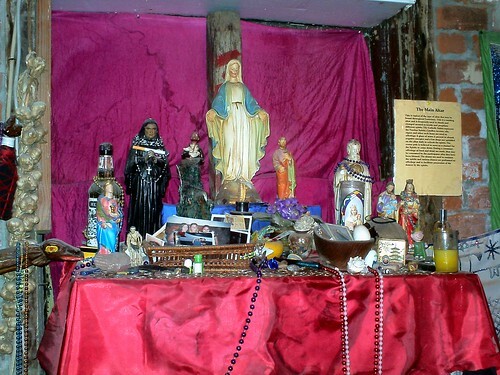 NOLA Voodoo is a non-initiatory religious system (which is why the terms “houngan” and “mambo” are not used), and practitioners who want to be initiated usually have to travel to Haiti for it. The main altar. The wooden rod in back is where the lwa come down. 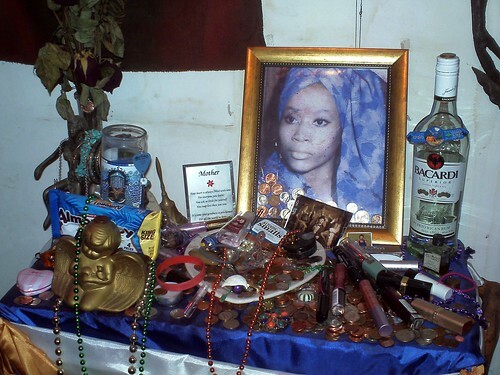 Yemaya is one of the Yoruban orisha that made its way into NOLA Voodoo in the 20th century, probably via Santeria.